All companies with an annual payroll of R500 000 and above must submit their Workplace Skills Plan (WSP), Annual Training Report (ATR) and Pivotal Report (PVT) to the relevant SETA for approval before 30th April every year. Failure to do this will result in a zero score on skills development as this is a strict requirement for the new B-BBEE codes. The Mandatory Grant has an important function. It is designed to encourage employers to provide data to their SETA on their workforce and skills needs based on their WSP and ATR. 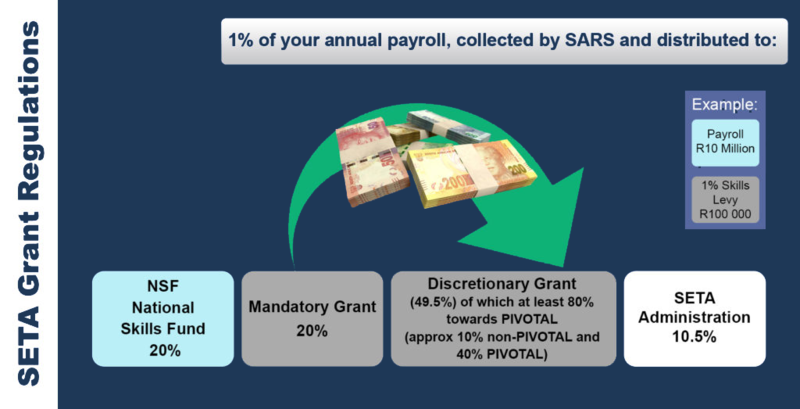 The mandatory grant related to WSP’s and ATR’s stands at 20% of an employer’s 1% skills levy. You will be able to claim back a large portion of money spent on training and upskilling your staff. The amount you can claim back from your SETA depends on your annual payroll. 15% of the levy your company pays when you appoint and register a skills development facilitator. 10% of the levy when you prepare, submit and get approval for a workplace skills plan for the appropriate SETA. 20% of the levy when you prepare an annual training report based on your approved workplace skills plan. Companies can claim the cost of training, facilitators, training venue costs, course fees and course material. There must be documentation to prove the above.